The discussion continues in our letters pages. Nick Duffell’s letter on therapeutic work with boarding school survivors (‘Boarding school syndrome’, April 2016) raises some interesting questions about psychology’s focus. As he points out, inattention to the problems of the elite does a disservice not only to the individuals directly affected but also to society as a whole, given that the privately educated are overrepresented in positions of power and influence. This seems particularly pertinent when the government is pursuing an austerity agenda suggestive of an underlying lack of empathy for the more vulnerable members of society. I was also intrigued that Nick Duffell should cite (a television adaptation of) a novel in support of his plea for more research in this area. I wonder how much of our commonsense psychology stems from fiction and whether this deepens or distorts the knowledge base. Psychologists and writers have many areas of overlapping interest in exploring what it means to be human. In the April edition of The Psychologist Nick Duffell’s letter ‘Boarding school syndrome’ stated ‘we urgently need more evidence-based research…we need your help to develop this field’. It is correct that little research has been conducted into the effects of boarding school. However, we would like to draw attention to a recent large-scale investigation into the effects of boarding school conducted by us (Martin et al., 2014). The study was funded by the Australian Research Council and the Australian Boarding Schools Association and was one of the largest ever conducted into boarding school. We surveyed 5276 students from 12 schools in major cities and regional areas of Australia. A total of 28 per cent were boarders and 72 per cent were day students, all located in the same schools catering to both boarding and day students. Ages ranged from 11 to 19 years. We assessed academic and personal wellbeing outcomes. Academic wellbeing measures included achievement, motivation, engagement, buoyancy, and goal setting. Personal wellbeing measures included life satisfaction, mental health, sense of meaning and purpose, and relationships with peers, parents, and teachers. We found significant differences between boarding and day students on eight out of 18 academic and personal wellbeing outcomes, after controlling for background characteristics such as socio-demographic, ability, personality, and school factors. Boarding students were significantly higher on adaptive motivation, academic buoyancy, growth goal setting, sense of meaning and purpose, life satisfaction, parent–child relationships, and extracurricular activity; (not surprisingly) they were also significantly lower in school absenteeism. Thus, our findings suggested there was general parity between boarding and day students. Further, where differences emerged, effects tended to favour boarders. Notably, as part of our broader research programme, we also found that inclusion of students’ background characteristics and pre-existing attributes was crucial to findings. Without accounting for pre-existing differences in boarding students’ socio-demographics, ability, personality, etc., we did not find positive effects for boarding. Hence, in comparing the outcomes of boarding and day students, it is vital to account for background factors that are not a result of the boarding experience itself. We also point to recent efforts the sector has made to redress the adverse effects of boarding school on children’s development witnessed over the years. In the United Kingdom, for example, there is now greater regulation and oversight of standards of care as articulated in the 2015 Boarding Schools: National Minimum Standards document. Similarly, in Australia, there are signs the sector is modernising, with greater attention to pastoral and academic care, better resources recognising the individual needs of students, articulation of the rights of boarders, training of staff, and greater family involvement. Nick Duffell is right: this is a critical research area and we do need more research. Ours is but one study, conducted in Australia. Without question, there is further to go for the boarding sector and research will be vital to informing its direction and progress. Perhaps our findings signal the beginnings of more positive green shoots in the boarding sector. Time and research will tell. Martin, A.J., Papworth, B., Ginns, P. & Liem, G.A.D. (2014). Boarding school, motivation and engagement, and psychological well-being: A large-scale investigation. American Educational Research Journal, 51, 1007–1049. Apologies that I missed these interesting comments until now. First I must declare my bias as last year, with Nick Duffell as co-author, I published 'Trauma, Abandonment and Privilege: a guide to therapeutic work with boarding school survivors' (Routledge 2016). It is true that research is needed in an area which is very under-researched. Most scholarly wrtiting on the topic tends to concentrate on the psychological problems that arise from a boarding school experience. Indeed when I recently googled 'boarding school - psychological benefits' 9 of the first 10 entries that came up were in fact related to psychological harm. Hence I am inclined to welcome any work that seeks to highlight benefits. However, speaking as I did at first about potential bias, I found and read the full paper summarised by Andrew Martin (above) and note that the research was part-funded by the Australian Boarding Schools Association which is an organisation that “promotes the interests and wellbeing of boarders, boarding staff, boarding parents and boarding institutions in Australia”. 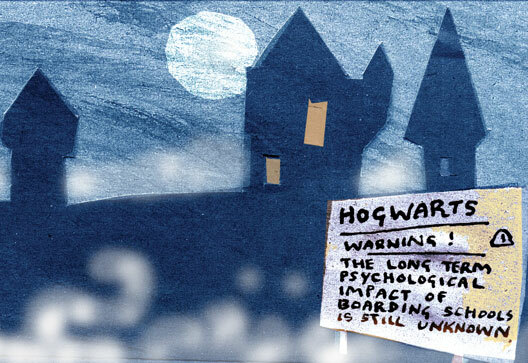 I perhaps should have said a little more about the kind of research on the psychological effects of boarding education needed when I made my request in the April edition of The Psychologist. Having read Andrew Martin et al‘s paper, I admire the thoroughness of their research on current adolescent boarders. But Boarding School Syndrome is an adult problem, with its genesis in ruptured childhood attachments exacerbated by high expectations from the social privilege conferred by elite boarding institutions. Boarding School Syndrome does not show itself for maybe 10, 20 or 30 years, when the Strategic Survival Personality begins to falter. Who would not expect – as Martin et al found – that the wonderful resources of such places regularly translate into academic success? The blandness of interview results in comparing children living at home do not surprise me either: for 30 years ex-boarders have told me how they had to put on their ‘happy faces’ – understandable, since all boarding children have to survive it. How to fund such a longitudinal study on a syndrome that might take 20 years to appear? I doubt any boarding schools association would be interested.